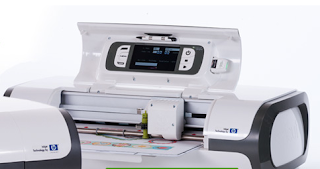 The Cricut Imagine machine is a machine that combines the capabilities of the Cricut Expression with the ability to print images. It allows you to cut out images and layers that you have printed. It is a joint venture between Provocraft and HP, a leader in the printer industry. 1) Size of Machine: 24.5" x 13.5" x 7"
3) Allows you to use both your existing Cricut cartridges that fit in the Expression, Baby Bug, Create and Cake Machines AND the new Imagine cartridges. Uses 12x12 Imagine mats (cannot use Expression mats) and can cut a variety of materials like patterned paper, cardstock, transparency, photo paper, etc. (except stiffer ones like chipboard). 5) Same functionality as the Expression (autofill, quantity, flip, fit to page, load last) except centerpoint. However, screen shows where image is on mat so visuals take care of fit to length, portrait, etc. features. Can use smaller paper and machine adjusts images accordingly. Cannot move blade independently. 10) You can set an exact color using R,G,B values or a color picker to flood an image with color, print it and then cut it. You can also use pre-loaded colors and patterns on the Imagine cartridges. 11) Machine has stored in it some basic shapes such as square, circle, rectangle, heart, scalloped square, scalloped rectangle, scalloped circle, scalloped heart, word bubbles, tree, baby onesie, duck, and various top note shapes. These cut be cut out plain OR filled with color and cut. 12) Prints to approximately 11.5" x 11.5" and may be water fast and/or archival on designated HP paper products. TUNE in to HSN on Tuesday, September 14, 2010 at 12:01 a.m. for the world launch! Click to see more about the Cricut Imagine Machine! Love it! Must have it. I really enjoy your videos, its been a nice introduction! great facts!! I love your videos too! Can't wait to see what's next! What a luxury this would be to have in addition to the Expression! Good Christmas wish list idea. Thanks for all the info. Thanks for all the info on the imagine... love what you have been designing. So appreciative of all the info about this new machine! Thanks so much for the detailed information! Thank you Joy, it's good stuff to learn :D.
Ack another question... now that we can make things larger than the page on the Gypsy and the Gypsy just cuts what's on the mat (wait till you see the proect I'm working on lol). Can I do the same thing on the Imagine? Take the top note from Create a Critter and make it 20 inches high so it looks a bracket edged paper. I want one, I want one...if I keep the whine up do you think they will just give me one? You know you have worn my resolve down and I just know I'll be ordering one from HSN. You said it could be used with the Gypsy.. then said it could not be used with it... ?? They are working on Gypsy compatibility. An update should be forthcoming. Thanks for the calibration, it is always good information, just keep it in your archieve for whatever time we each get an Imagine and need this information. Great information! Can't wait for Tuesday! I so enjoyed your video of you opening the Imagine box. How cute!!!! I really want this new machine and I think I understand most of it's operations. If I have my facts correct, you can use all of your regular carts along with the imagine carts???? You can then print and cut images from the old carts using the colors and patterned paper supplied from the imagine carts?????? Is this true??? Please correct me if it is not. Would definitely like to know before the world launch on HSN if at all possible. Thanks so much for all the info you two have been feeding to us. Since you have the machine in house, you are are experts. Thanks. Thanks for all of the great info!!! Wow its not too bad actually I love the vibrant colors thank you! I know it's the rave, but I'm still not sure this is the one for me - but I am excited to see all this one can do! I must have the Imagine. Can't wait for HSN Launch. Thank you for all the great info!!! Great list of some basic facts. thanks! Everything has been amazing. So much information and enticing. Thanks Joy for the run down about this machine. The more I learn about it the more I want it. Will it be compatible with Design Studio eventually? Will it print on fabrics and will HP come out with washable ink cartridges for this purpose? Really enjoyed the video of you opening the box and your first project. Kepp up all of the great information. Thanks for keeping us updated with all this info; we do appreciate it and it's very helpful! Q: now that we can make things larger than the page on the Gypsy and the Gypsy just cuts what's on the mat (wait till you see the proect I'm working on lol). Can I do the same thing on the Imagine? Take the top note from Create a Critter and make it 20 inches high so it looks a bracket edged paper. ANSWER: I don't know as the Gypsy software update hasn't happened yet. Q: Will it be compatible with Design Studio eventually? Will it print on fabrics and will HP come out with washable ink cartridges for this purpose? ANSWER: Don't know about DS. Fabric idea is GREAT - haven't heard any plans about this but you could write this idea into them and present it! Thanks for the information. It is a very interesting machine! I am fairly new to scrapebooking. My husband bought the Cricut Imagine for my Christmas Gift. I just have the one cartridge that came with the Imagine. I think I will truly love this machine. Can't wait until I have more of the cartridges. I stumbled on this amazing site today. Thanks for all the help topics.